Wait a minute. Not only is that the longest run-on sentence I’ve yet to produce, it’s also not really about a DC neighborhood bar, is it? 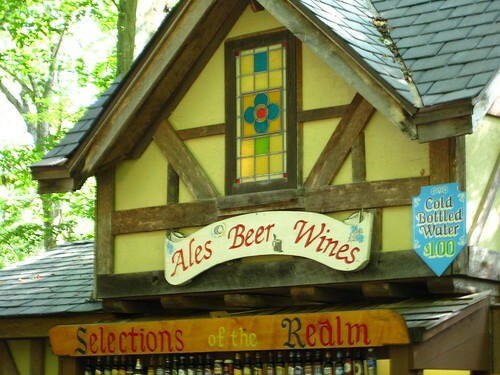 Yes indeed, it’s We Love Drinks Goes to the Maryland Renaissance Festival! A local institution since 1977, the venerable Maryland Renaissance Festival has been a fall tradition that I seem to frequent every other year or so. And no, though I am a costume designer, I do not dress up, so there will be no incriminating photos after the break. You really cannot beat the kitsch of the Festival – especially the ridiculously bad accents and the haphazard jumbling up of historical timelines (barbarians? goth gypsies? insane fun). But what I notice most year after year is the drinking. A large portion of the Festival-goers appear to inbibe quite a bit. I overheard a security guard telling a tarot card reader that he’d thrown a couple out at 11am for drunken disorderly conduct. That must be a record, as they open at 10am. I’m not advocating that kind of behavior. You can certainly enjoy the Festival without bodily injury or personal shame. 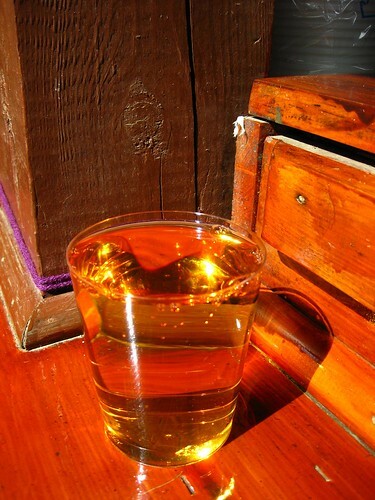 But what I am most definitely in favor of is relaxing with some mead at O’Shucks. 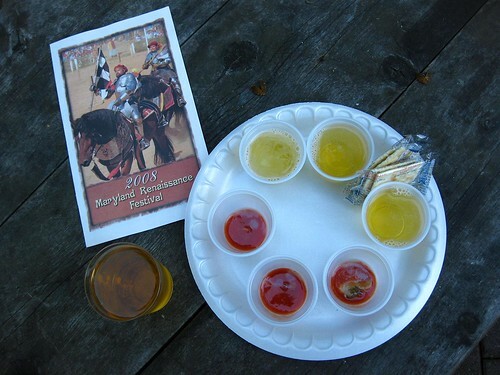 The Festival serves Maryland winery Linganore’s Medieval Mead. This sweet syrupy stuff may not be the elixir of choice for everyone – uncomplicated and super sweet, the honey aroma attracts every bee within miles to your side – but it’s pretty and has a delightful scent. Though I now prefer to drink Ethiopian honey wine instead, I’ll still sip a cup of mead as my preferred accompaniment to a half-dozen oysters – call it the Viking’s Breakfast. You could also have the Viking’s Second Breakfast, more commonly known as oyster shooters. Normally as an oyster freak I would dissuade you from having your oysters with anything but their brine, but these aren’t the most pristine selection so drowning them in cocktail sauce and chasing them with ale is perfectly appropriate. Upgrade to cider if you wish. Most of the wine at the Festival is from Linganore, and again it’s all pretty uncomplicated quaffing. The little Wine Pavillion is a popular spot where you can sample several varieties like White Raven or Raspberry – or go completely crazy and mix them up for a wine cocktail like “There Oughta Be a Law” (they keep a list of options behind the bar) – wait, that might turn you into that couple that got thrown out at 11am. 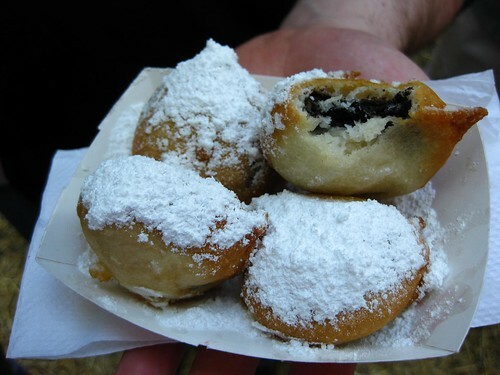 To avoid that fate, be sure to chase your drinks properly with an Olde English treat like deep fried Oreos, Snickers, or even Twinkies. There are only two weekends left, and then, like fabled speakeasies, O’Shucks and the other taverns of Revel Grove will shutter for the season. So hie thee hence, get a cup of mead, watch out for bees and drunkards, and relax under the leaves and sun.